WRITE THE NATIONAL PARK SERVICE! They can stop Dynegy's massive stabilization project, their first step toward leaving their coal ash in place. Click to write letter and access talking points. Dynegy's prior plan included leaving the ash in the floodplain of the river and capping the three pits with 2.5 inches of a geomembrane; 15 inches of a geocomposite; and 3 feet of soil. This is a short-term, cost-cutting solution for the company that would leave the liability of the ash stored at this site to future generations. Dynegy's November 2, 2017 submittal to the Illinois Environmental Protection Agency shows two options for stabilizing banks along the Old East and North Ash Pits that would set the stage for leaving the ash in place. The utility is promoting the "cap and leave" solution with riverbank stabilization similar to that installed at the New East Ash Pit as their best option for protecting the river from coal ash pollution. During the summer and fall of 2017 Dynegy has taken local officials and opinion leaders on tours in an attempt to counter assertions made by Eco-Justice Collaborative, Prairie Rivers Network, and others that this solution will not stop groundwater pollution nor protect the river, long-term, from ongoing erosion. The IEPA issued a notice of violation in 2012 for groundwater exceedances of heavy metals. The river banks that abut the two old coal ash pits are eroding. Armoring installed in the 1980's has deteriorated. Toxic ash is leaching into the river from the two older, unlined pits. A breach could send toxic waste into the Middle Fork, with devastating environmental and economic consequences. Dynegy's closure plan does not include proposals for replacing failed stream bank stabilization abutting the two older ash pits. The riverbank next to the New East Ash Pit eroded by as much as 20 feet between 2009 and 2015 (just 6 years). Dynegy said the river banks were as close as 10 feet to the toe of the slope of the New East Ash Pit at one location. Seeps and pollution are already occurring. This is because there is contact between the unlined ponds and groundwater (which flows through the pits toward the river). In 2008, the IEPA found that coal ash pollution was flowing into the river from seeps along the riverbank that abuts the two oldest pits. According to a January 2013 internal IEPA email, an agency representative “had no problem collecting seepage at the base of the berm, which is right on the riverbank.” Water quality analysis confirmed this was ash seepage (leachate, i.e., groundwater entering the surface water), and that boron from seeps at the “lower pond” (the Old East Ash Pit) was present at about three times the chronic water quality standard. This seepage can only be seen from the river. Click here to watch a short video showing seeps actively leaching chemicals along the Old East Ash Pit. This film clip was taken by Eco-Justice Collaborative in June of 2017. Illinois Power installed gabions (wire cages with rocks) along the bank adjacent to the Old East and North Pits in the 1980s. But the gabions have been ripped away from the bank of the Middle Fork by the powerful forces of the river. This has left the riverbank vulnerable to erosion once again, and the wire mesh that now is located in the river’s channel (instead of on the bank) is a hazard for those who use the Middle Fork for recreation. Dynegy had to seek emergency approval from state and federal agencies to shore up the bank next to the New East Ash Pit in the fall of 2016. This was because the river had eroded as much as 20 feet of protective bank next to the ash pit in just six years. According to their own internal correspondence, Dynegy reported that at one location just 10 feet remained between the river and the toe of the slope of the New East Ash Pit, making failure a real possibility. The erosion was so extensive that it also destroyed two monitoring wells. Reinforcing the bank will offer some protection medium-term, but it is not likely to permanently stop erosion. This is because the bluffs and topography in the area of the coal plant direct the river flow toward the coal ash pits. When the river is at high flow, boulders, downed trees, and ice flows forcefully scour the banks. There is no other route for the river to take (see graphic, below). These factors, compounded by an expected increased intensity of storm events caused by a changing climate, raise concern that any bank stabilization measure eventually will be compromised by the natural forces of the river. No bank reinforcement will last forever. We know that the river has demonstrated it can erode through even robust bank stabilization. After Dynegy leaves, the responsibilities for repair; replacement; and cleanup, in the event one or more of the impoundments is breached, could fall upon the taxpayer. Covering the pits will not separate the ash from the groundwater, nor prevent the lateral flow of groundwater through the ash from the west toward the river. Hydrogeological studies by Dynegy’s consultants have confirmed that groundwater moves from the western side of the river valley, through the North and Old East Ash Pits toward the Middle Fork, discharging into the river. The proposed closure plan would reduce infiltration from above the pits, but not eliminate the flow of groundwater toward the river. Under flood conditions, the rising river water could come into direct contact with the coal ash in the unlined pits. As the water recedes, it would flow back into the river carrying with it coal ash pollutants. This phenomenon would not be eliminated by capping the pits. 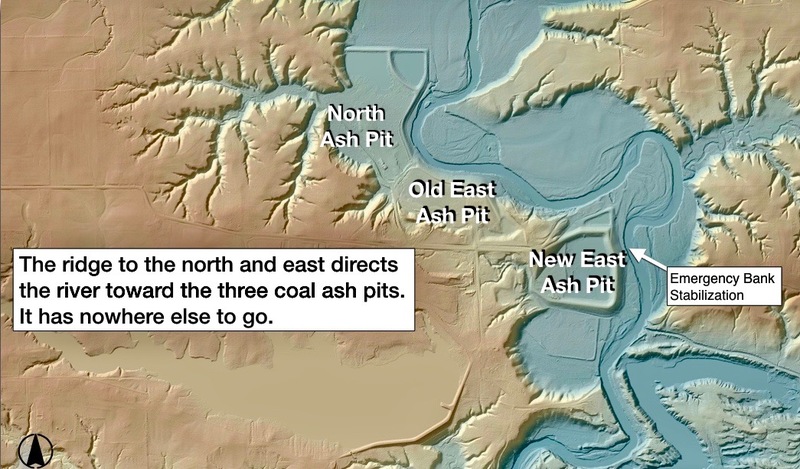 Although to the naked eye, the coal ash appears to lie well above the river, Dynegy’s hydro-geological studies show that the ash in the North and Old East Ash Pits extends down as much as 30 and 44 feet respectively, intersecting the water table. 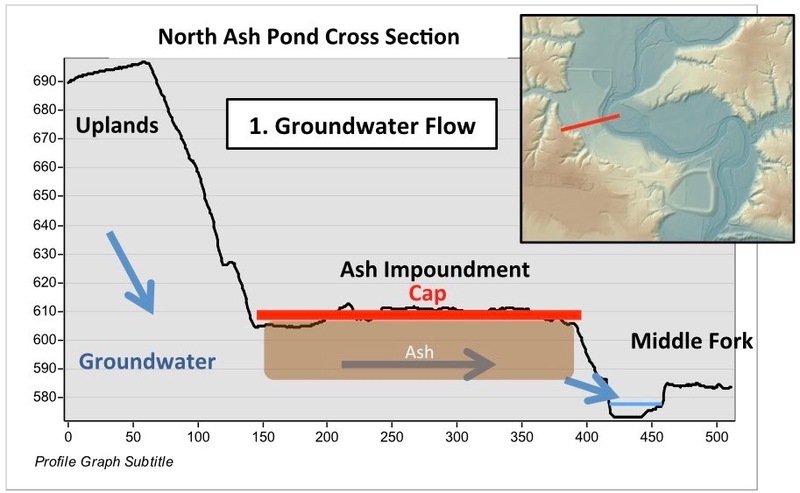 North Ash Pond Cross--Section showing continued groundwater flow through ash pit with (or without) cap. Prepared by Andrew Rehn, Prairie Rivers Network. September 2016. Dynegy needs to act responsibly and move its contaminated waste out of the floodplain of the Middle Fork of the Vermilion River to a properly-designed facility upland on its property. Dynegy also should install modern pollution controls and monitoring. This is the only permanent solution that will ensure that area groundwater and surface waters will be protected from future contamination for generations to come. One easy way to take action now is to send an electronic letter Governor Pritzker and Illinois EPA Director John Kim. Ask them to require Dynegy to move its coal ash from the floodplain to a properly-designed facility on its property, away from the river. Personalizing your letter will have the most impact. Other states are requiring utility companies to relocate their ash, so why aren't we?